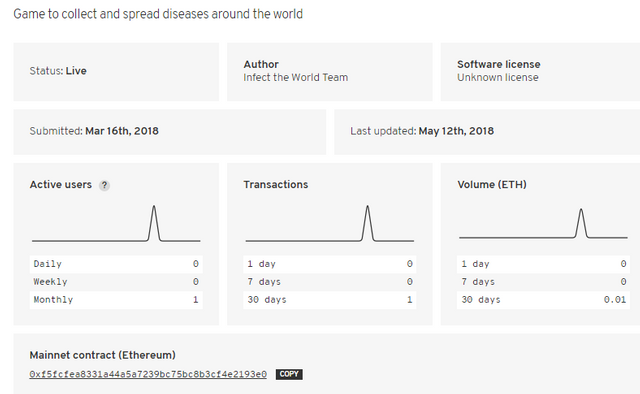 Scrolling into many interesting games and very interesting names in the Category of the Games in the Website of State of the DApps, I have finally found one interesting game with a strange name "Infect the World" a game to collect and spread diseases around the world! The author of the game is Infect the world team which made the game based on Ethereum Blockchain. The game does not have any active players in recent months, only one player per month, which made only one transaction per one month with the value of 0.1 Ethereum. Up to now, I have never played any game in the blockchain, but I have made many reviews and wrote articles about the games and their whitepaper. Since most of the games have their whitepaper only but not any Minimal Viable Product. But sometimes the name attracts you and you want to know what that project is all about. Infect the world game has a 100% decrease in the volume from the last week. What is Infect the World? 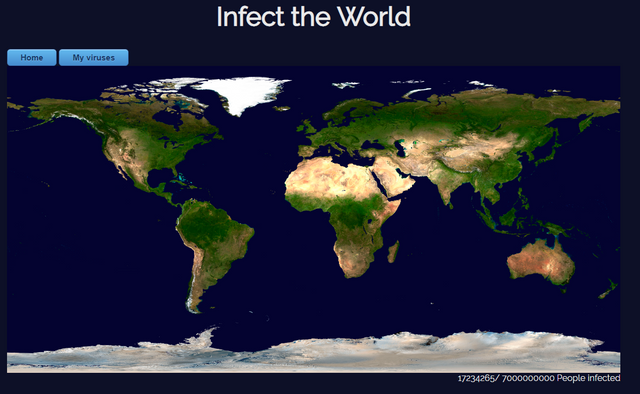 As seen from the main image of the game, the aim is to infect every single individual from all 7 billion people around the world. Which means that the main aim here is to purchase as more as products that will give harm to people around the globe. So there is less than a quarter number of people that are infected by the virus. 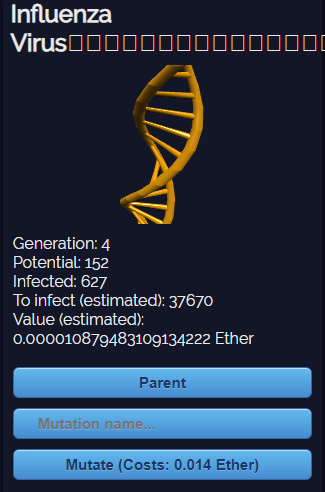 You can get your own virus by purchasing it with Ethereum and there are several types of the viruses, like many people you want to infect that much you have to buy a greater virus, which is more expensive. The concept of the game is totally weird but at the same time very interesting if it was competitive between people who are infecting more with time. And this is how they would spend more of their Ethereums and enjoy their game and their competition. But the User Experience of the game does not seem to be quite well. Because it still needs a lot of time for the improvement. Since in the world map and the blockchain of this game, there are many slots left or people left to be infected. I am wondering if you read this would you like to infect some people in this map? I would if there would be some rankings and competition between the game or the rewards for people that are in the top that made the most infections. So to get your own virus in the Mutate button you can give a name to your own virus and click for the payment, sending the payment to the given Ethereum address. But most importantly from the infections, if you buy a virus, it will give you some amount of Ethereum back and you can withdraw it in 24 hours, but it depends from the amount of Ethereum that people spend that day on the viruses. As far as I can see the game is still in the development mode and has a strange concept, but it is totally attractive as I am attracted to its name!